کامران هاشمی, -. (1387). کشورهای مسلمان ، حق شرط ها و ماده 2 پیمان نامه حقوق کودک در مورد تبعیض. 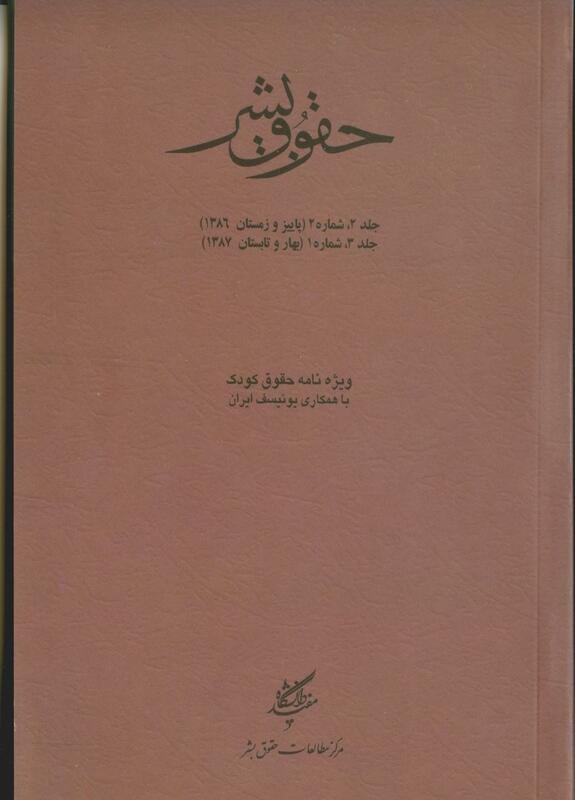 دوفصلنامه حقوق بشر, 03(1), 81-102. - کامران هاشمی. "کشورهای مسلمان ، حق شرط ها و ماده 2 پیمان نامه حقوق کودک در مورد تبعیض". دوفصلنامه حقوق بشر, 03, 1, 1387, 81-102. کامران هاشمی, -. (1387). 'کشورهای مسلمان ، حق شرط ها و ماده 2 پیمان نامه حقوق کودک در مورد تبعیض', دوفصلنامه حقوق بشر, 03(1), pp. 81-102. کامران هاشمی, -. کشورهای مسلمان ، حق شرط ها و ماده 2 پیمان نامه حقوق کودک در مورد تبعیض. دوفصلنامه حقوق بشر, 1387; 03(1): 81-102. پیمان نامه حقوق کودک که جهان‌شمول‌ترین معاهده بین‌المللی حقوق بشر محسوب می‌گردد، در مقایسه با دیگر اسناد حقوق بشری فرصت‌های بیشتری را جهت توازن ارزش‌های سنتی از یک سو و حقوق بشر بین‌المللی از سوی دیگر فراهم آورده است. در همین راستا، پیمان نامه‌تنها معاهده بین‌المللی است که در آن به طور صریح به «حقوق اسلامی» اشاره شده است. بااین وجود و علی‌رغم مشارکت فعال کشورهای مسلمان در تدوین پیمان‌نامه، این معاهده نیز همچون پیمان‌نامه محو انواع تبعیض علیه زنان با بیشترین حق شرط‌ها و یا اعلامیه‌های تفسیری آن کشورها مواجه شده است. با عنایت به ملاحظاتی که کشورهای مسلمان چه در قالب حق شرط‌ها و چه در خارج ازآن نسبت به تطابق مفاد پیمان‌نامه با سنن مذهبی خود داشته‌اند، این مقاله به یک مطالعه تطبیقی در قوانین و رویه قضایی آن کشورها در ارتباط با تأثیر سنن مذهبی بر اجرای ماده 2 این پیمان نامه می‌پردازد و هدف اصلی‌اش آن است تا تجارب مثبت آن کشورها را در اختیار یکدیگر گذارد. The Convention on the Rights of the Child, which came into force more than seventeen years ago, is the most universally accepted human rights treaty. It is the first legally binding international instrument to incorporate the full range of human rights, civil, cultural, economic, political and social rights. The Convention also offers greater opportunities than most human rights instruments for balancing traditional values and international rights. Notably, this convention is the only international treaty that includes an explicit reference to ‘Islamic law. In the meantime, along with the Convention on the Elimination of Discrimination against Women, the CRC has received the most religious based reservations of Muslim states on different articles and/or on the treaty as a whole. This study will examine the relevance of these reservations to the practice of Muslim legal traditions, with regard to Article 2 of the Convention on the issue of distinction and discrimination. Berger, Maurits S, ‘Conflicts Law and Public Policy in Egyptian Family Law: Islamic Law through the Backdoor’ 50 American Journal of Comparative Law, Summer 3(2002). Detrick, Sharon, The United Nations Convention on the Rights of the Child: A Guide to the Travaux Preparatoires(Dordrecht, London: M. Nijhoff Publishers, 1992. Hashemi, Kamran, ‘Religious Legal Traditions, Muslim States and the Convention on the Rights of the Child: An Essay on the Relevant UN Documentation’, 29 Human Rights Quarterly 1(2007). Kaplan, Yehiel S, ‘The Interpretation of the Concept of the Best Interest of the Child in Israel’, in Plurality’ in Gillian Douglas & Leslie Sebba (eds.) Children Rights and Traditional Values (Artmund & Ashgate, England, 1998). Goonesekere, Savitri, ‘The Best Interest of the Child: A South Asian Perspective’, in Philip Alston (ed.) The Best Interests of the Child, Reconciling Culture and Human Rights (Clarendon Press, Oxford, 1994). Nasir, Jamal J, The Islamic Law of Personal Status, Third Edition (Kluwer Law International, the Hague, 1990). Schabas, William A, ‘Reservations to the Convention on the Rights of Child’18 Human Rights Quarterly 2 (1996). Van Bueren, Geraldine, ‘Children’s Rights: Balancing Traditional Values and Cultural Plurality’ in Gillian Douglas & Leslie Sebba (eds.) Children Rights and Traditional Values (Artmund & Ashgate, England, 1998).